Uglyworld #2140 - Outs Of Orders - (Project Cinko Time - Image 337-365), a photo by www.bazpics.com on Flickr. This afternoons I was thinkerings again if I would getters the chance to says hello to Chipper, and checkereds our travellers scheduler on Baz's laptoper. Befores I could even checkers the plans for tomorrow I discovereds something mega alarmerings, Baz has a telemaphone conferencer calls schedulereds for midnighters, yups, you heareds me rights, midnighters! 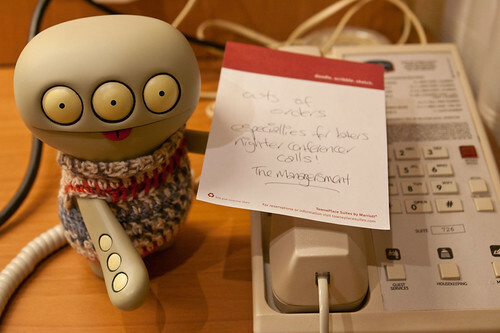 I has decidereds that I needs to takes matters directly intos my own flippers, so I has draftereds a letterer from the hotels managersment to hopefully prevents him from diallerings in at midnighters! Backs to Chipper now, unfortunatelies I callereds his telemaphone liner downs in Crater Lakes and only gettereds a pre-recordereds messager that he is already in his winters hibermanations, so it would appears that my wishes will nots come true this times arounder, such a pitys!